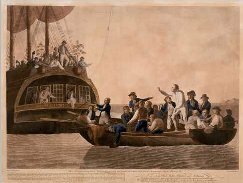 We’ve all heard of the “Mutiny on The Bounty” (1789) but what exactly is “mutiny”? Mutiny was not very well defined in the Articles of War and it was the captain of the ship who had to decide whether or not an offence was serious enough to be treated as mutiny. It was the most serious offence you could commit in His Majesty’s service and conviction carried the death sentence although this was beyond the captain’s authority and could only be ordered by a court martial. The term “mutiny” could be applied to almost any act of defiance or disobedience whether it was by a single individual, as often happened, or by some or all of a ship’s crew. Actual violence was rare and most mutinies were refusals to carry out orders and seldom happened while ships were at sea and never in the presence of the enemy. The main reason for mutiny was to air a grievance, or grievances, from which the ordinary sailors had many to choose – poor pay, poor food, poor medical treatment and punishments that were often brutal and unjustified. For this reason, mutiny usually happened in port where there were senior officers on hand who could be called upon to intervene to hear the grievance and, rather urprisingly, the mutineers usually got a fair hearing and in some cases changes were made and no disciplinary action was taken. Captains and other officers were sometimes removed from their ships when crews steadfastly refused to accept their authority and such incidents were usually allowed to pass. “He [Hotham] came on board [on 7th. January 1797], had the officers armed on the quarterdeck and all hands turned aft to hear his commission read at the capstan head. They all cried out, ‘No, no, no.’ He asked what they had to say against. One of the petty officers replied that his ships company informed us that he was a damned tartar and we would not have him and [we] went forward and turned the two forecastle guns aft with cannister shot. “He then went in his boat on board Commodore Nelson’s ship and returned with the Commodore’s first lieutenant. When on board he ordered all hands aft. He called all the petty officers out and paraded them in a line on the quarterdeck. ‘Now, my lads, if you resist taking Captain Hotham as your captain, every third man shall be hung.’ The crew flew in a body forward to the guns with match in hand, likewise crowbars, handspikes, and all kinds of weapons they could get hold of and left him, Captain Hotham and the officers standing looking at us. They consulted for a moment and returned on board Commodore Nelson’s ship. “In the space of half an hour the Commodore himself came on board, called all hands aft, and enquired the reason of this disturbance. He was informed of Captain Hotham’s character, which was the reason that we had refused him. Mutiny was a serious business and a failed mutiny saw men swinging at the yardarms of their own ships in exemplary punishments handed out by courts martial determined to remove this blight from the service. 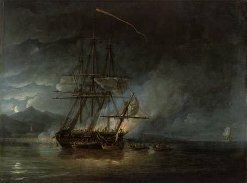 the crew of the frigate Hermione rebelled against the officers, killed the captain and eight other officers, took possession of the ship and committed the unthinkable act of surrendering it to the enemy. What drove the crew to such extreme action that mutiny became murder and could even be regarded as an act of treason ? 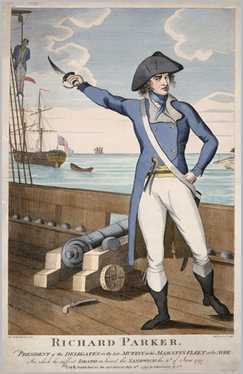 Captain Pigot of Hermione was a tough disciplinarian, a “martinet” who provoked his men into taking matters into their own hands and risk hanging rather than serving under such a brutal master. Pigot had ordered sail to be shortened but didn’t like the way the topmen had performed and threatened to flog the last two men who descended from the rigging. In the ensuing panic, two men fell to their deaths on the deck below and to compound the cruelty of his threat, Captain Pigot ordered the bodies to be thrown overboard. It was hardly surprising that, during the coming night, loose cannon-balls were rolled around the deck as an ominous warning that mutiny was impending. However, the navy could not simply sit back and do nothing. A raid by the frigate HMS Surprise recaptured the Hermione from the Spanish and many of the mutineers were rounded-up, court martialled and hanged. No-one emerged from this with any credit but it served to highlight the fact that there were many aspects of the service that needed urgent attention. The Spithead mutiny in April 1797 did lead to general improvements in the conditions. The Channel Fleet under Lord Bridport mutinied and refused to weigh anchor. There was no violence and no-one was hurt but sixteen battleships, the main defence of the kingdom, remained at anchor until a list of grievances were examined by the Admiralty who, within a week, granted the first pay-rise since 1658 and agreed to better food and provisions. All the mutineers were pardoned. But, the mutiny spread to The Nore where it appeared to some to be a more sinister, politically motivated affair. Here, the mutineers demanded more shore-leave, regular payment of wages, fairer distribution of prize money, removal of unpopular officers and changes in the Articles of War but, this time, they went A3700too far. On the face of it, such demands seemed reasonable enough but the mutineers attempted to blockade the London merchant trade and this provoked both the Admiralty and the government to act against them. For a while it looked as though other British warships were going to engage them and the mutineers soon realised that they were in trouble and, one by one, the ships surrendered including the flagship HMS Sandwich where the mutiny had started. The mutiny achieved nothing and Richard Parker, the leader, was hanged along with others who were seen as activists. Many more were flogged or imprisoned. A refusal to obey orders was one thing but attempts to disrupt the nation’s trade was quite another. Nelson himself never suffered the indignity of a mutiny. But, after the Blanche incident we can easily imagine the anger he must have felt when he heard what his first lieutenant had threatened to do to the frigate’s crew. It was a threat that no court martial could have approved. A large proportion of the navy were reluctant sailors having been taken, forcibly, by press gangs. Most of them were realists and accepted that there was nothing they could do about it and the best thing to do was to get on with the job of defeating the enemy so that they could all go home and resume a normal life. But, in return for this, they felt entitled to expect that the sea- officers and the Admiralty would, at least, do their best to minimise the hardships. It was the actions and inactions of bad and uncaring captains and other officers that often sparked a mutiny. Nelson was one of the many professional sea-officers who understood the importance of looking after their men as best they could in the difficult circumstances presented by life in a sailing warship. They knew that if they did their best for their men, their men would do their best for them. And so they did. “Nelson’s Navy” by Brian Lavery. “Horatio Nelson” by Tom Pocock. “Nelson: A Personal History” by Christopher Hibbert.